One of the most notorious incidents in the bloodthirsty annals of Scottish history emanated from the Braes of Balquhidder – and one that was to ultimately have repercussions that were to echo down the years for generations to come. The MacGregors were a landless “broken” Clan who, by fair means and foul, had had most of their lands wrested from them by the more powerful Clan Campbell. Hounded from their own territories, mainly around Glen Orchy, they had settled in large numbers in the MacLaren heartland of Balquhidder and had long used the nearby King's Royal Forest of Glenartney as their favoured hunting ground in pursuit of ample supplies of deer to be found there. Their illegal forays had been a constant headache for the King's Keeper of the Royal Forest John Drummond-Ernoch, brother-in-law to Alexander (Alistair) Stewart, the Laird of nearby Ardvorlich castle on the banks of Loch Earn. The Ardvorlich Stewarts had long been the most illustrious and powerful family in the Breadalbane area, descended as they were from the early Stewart Kings and Robert the Bruce himself, and Drummond-Ernoch was also very well-connected as a scion of the powerful Drummond family. In October 1589 King James VI had married Princess Anne of Denmark and a great celebration was in order to welcome her to her new Scottish home. 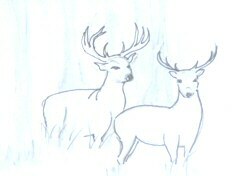 John Drummond-Ernoch instructed his foresters to set about hunting the required deer for the venison for the feast. For years Drummond-Ernoch had been plagued with hunting parties of Balquhidder MacGregors, often accompanied by their cohorts MacDonalds from Glencoe, poaching the best animals which should have been destined for the King's table. Many warnings had been issued to the marauding thieves but all had fallen on deaf ears. So incensed was he, therefore, when he entered the Royal Forest with his assistants to hunt down the deer for the Wedding Feast to find that the thieving MacGregors were once again there before him, ready to carry off the best animals back to their lairs in Balquhidder. This particular gang of brigands included the grandsons of that scourge of the Central Highlands , Duncan Ladasach MacGregor, the head of a family of notorious, wild freebooters who had terrorized the country for generations. He and his sons were eventually made to pay for their reign of terror by their eventual execution at Kenmore but the old man's grandsons were more than happy to carry on the family tradition. They were every bit as feared as their forefathers and were known locally by the descriptive name of MacEach – Children of the Mist. This time John Drummond-Ernoch had had enough. If all his warnings were continuing to fall on deaf ears, then by God, he swore, I'll give them real deaf ears this time! No one should be allowed to rob the King's table, particularly the Wedding Feast itself to welcome Scotland 's new Queen. The time for verbal warnings was long past. As the Balquhidder MacGregors and their MacDonald cronies set about their next foray in Glenartney's forest, the Keeper and his men were lying in wait. After a pitched battle they were cornered by the King's men and the thieves duly had their ears hacked off, as promised, in retribution for not listening to past warnings. The mutilated and humiliated gang were sent packing back to Balquhidder as an example to their kinsmen of what would happen if they ever ignored official warnings and entered the Royal Forest for thieving purposes again. 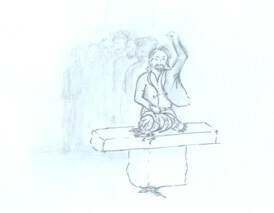 John Drummond-Ernoch, however, totally underestimated the wrath of the MacGregors after such a humiliation. Vengeance was their first and only thought. It boiled in their blood. They were their fathers' sons after all. Revenge had to be exacted and the sooner the better. They were well aware that the Keeper's sister Margaret was married to Alexander Stewart, the Laird of Ardvorlich on nearby Loch Earn, and a vile plan of retribution was hatched on that humiliating journey home to Balquhiddder. It was decided to hunt down Drummond-Ernoch whilst he went about his lawful business at a time they knew his brother-in-law Ardvorlich would be absent from home. No one was to humiliate a MacGregor and get away with it. The Drummond-Ernochs must pay. They duly bided their time until they heard that the Stewart Laird was to be away on business for the night and a party of them set out for the forest of Glenartney to hunt down their human prey. Murder was in their hearts and they had the Lairds unsuspecting brother-in-law in their sights. On capturing the poor man they showed no mercy. Their swords were soon dripping blood as they decapitated the Keeper and wrapped his bloodied head in one of their plaids. Their evil deed was going according to plan as drunk with blood and triumph they sped over the hills of Glenartney toward the moonlit shores of Loch Earn. Soon below the dark glowering mass of Ben Vorlich they caught sight of the waters of the loch and the imposing bulk of the Stewart residence standing sentinel on its banks. Carrying their bloody trophy wrapped in the blood-stained tartan of their Clan, they headed for Ardvorlich castle, where they knew the Laird's heavily pregnant wife Margaret would be home alone. She had been a Drummond-Ernoch before her marriage, the Keeper's younger sister, and that family had humiliated the Clan MacGregor. They must be made to suffer. One can well imagine young Margaret Stewart's thoughts as she heard the banging on the great wooden door that dark night, knowing that save for a few faithful retainers, she was home alone. Her fears were more than compounded when she opened it to find a party of wild-looking MacGregors standing on the doorstep demanding admittance. They were, without exception, the most feared men in the area. Highland hospitality being what it is, she had no choice but to invite them to step inside and, with a pounding heart, showed them into the great hall where the table was still laid with the remnants of her own supper of bread and cheese. Her unwanted guests immediately demanded to be fed and she left them at the table as she ran down to the kitchens to beseech her staff to prepare something more substantial for the surly gang waiting impatiently in the great hall above. Fear must have engulfed her as she made her way back upstairs to advise them their supper was on its way, but she was totally unprepared for the gruesome sight that awaited her. The MacGregors stood round the table glaring at her in a mixture of triumph and vengeance as she gasped in sheer horror at what lay before her. In the middle of the table on the big platter which had once contained only the remnants of her own supper, sat the blooded, severed head of her beloved brother John, with the remaining bread and cheese stuffed into his mouth. Her shrieks filled the great hall and brought the servants running up from the kitchens below as, totally traumatized, she fled screaming from the castle. Her only thought was to get as far away from the nightmare that she had witnessed as possible. The servants she left behind were too terrified and rooted to the spot with horror to even contemplate giving chase to the murderous gang as, bearing their bloodied gruesome trophy aloft they bade farewell to Ardvorlich castle and, mounting their horses, headed for home. Once the euphoria of the murder itself and its gruesome aftermath was over, a cold reality must have begun to draw on the party as they approached their MacGregor heartland of Balquhidder. Not only had they committed a heinous murder but they had killed the King's Keeper in a particularly barbaric manner and behaved abominably cruelly towards his innocent sister. They believed justice had been meted out for humiliating the Clan Gregor but would others see it like that? They had only one recourse – to fling themselves on the protection of their Clan Chief, Alistair MacGregor of Glenstrae. They would head first for his younger brother Ian Dubh's fortress home of Inch MacGregor at the Kirkton end of Loch Voil. Ian Dubh listened to their story and agreed that, in the circumstances, his Elder brother the young Chief himself had to be informed. How the young man dealt with it would be the first true test of his leadership, for Ian Dubh knew only too well that the atrocities that had just been carried out were bound to set the heather on fire and the consequences could be drastic indeed not only for the murderers but for the whole Clan Gregor. On hearing the gruesome story, Alistair MacGregor knew he could not be seen to fail his own men. He had no option if he was to command the respect of his people, he had to defend those of his own blood. The decision was taken that he as Chief of the Clan must lead by example and stand fast by those who had committed these terrible deeds and by so doing the others of the Clan would have no option but to follow his lead. A gathering of the whole Clan Gregor had to be immediately called and a ceremony take place to ensure complete fealty. They were born of one blood and if need be they would die as one. The following Sunday in the little Eaglais Beag Kirk in Balquhidder that fateful ceremony took place. It has gone down as perhaps the most gruesome episode in the whole troubled history of the Clan Gregor. Along with the Clan Chief, all the elders, and every MacGregor from miles around who could be mustered, they gathered together in that small kirk in the heather in front of the holy altar and the severed head of John Drummond-Ernoch was ceremoniously unwrapped from its blood-soaked plaid. Not a sound was heard as it was placed on the stone altar of the kirk and the revered banner of the MacGregors carefully laid over it. One by one, beginning with the young chief himself, the members of the Clan stepped forward to place their hands on the now bloodied banner covering the severed head of Drummond-Ernoch and took an oath to protect the guilty men from retribution on pain of their own deaths. One by one, according to rank, each man swore to take the blood-guilt for the murder upon himself and never to reveal the names of the real murderers. But every man there that fateful day knew that in doing so the die was cast. It was a day that was to go down in infamy in the already troubled annals of Clan Gregor. As soon as the news reached Edinburgh the King and his government were roused to fury and an emergency meeting of the Privy Council was called which resolved to wipe out this troublesome Clan forever. Letters of fire and sword were issued and the Clan Gregor was proscribed. On the third of February 1590 “the Lords of the Secret Council, being credibly informed of the cruel and mischievous proceedings of the wicked Clan Gregor, sae lang continuing in blood, slaughters, herships, manifest reifs and stouths” outlawed and condemned to death the whole Clan for the murder of Drummond-Ernoch. It was far worse than any one in Balquhidder could have imagined. Almost immediately, Fire and Sword were carried through the districts of Breadalbane, Strathearn, Rannoch, Lennox , Lorn,, and all parts believed to be harbouring members of the blacklisted Clan. A royal Order went out to “seek, tak, and apprehend” Alistair MacGregor of Glenstrae….together with “all others of the Clan Gregor or their assisters, culpable of the said odious murder, or of theft, reset of theft, hership and sorning”. Once captured, they were to be tried at a special Assize held on the spot and if found guilty were to be immediately executed, their possessions going half to the state and half to the person who apprehended them. If they defended themselves they were to be pursued with Fire and Sword throughout the land and the Commissioners to be acquitted of any violence or killing committed in the taking of them and were never to be called to account for it. The MacGregors of Balquhidder had become the most hated and hunted Clan in Scotland 's history. 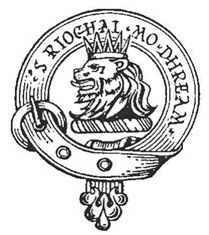 An act of the Privy Council was passed on 3 rd April 1603 which ordained that “the name MacGreoure suld be altogidder abolished, and that the haill persounces of the Clan sulde renounce thair name and tak them some other name and that thai nor nane of their posteretie sulde call thame selffis Gregoure or McGregoure thair efter under paine or deade”. One could argue that the catalyst for the terrible train of events that befell Clan Gregor stemmed from that dreadful day when the barbaric murder and beheading of John Drummond-Ernoch was carried out by the renegade band of reprobates bearing the name MacGregor, and one can well imagine the traumatized state of young Margaret Stewart of Ardvorlich as, heavily pregnant, she ran screaming from her home, heading for the sanctuary of the tall woods that shrouded the foot of Ben Vorlich, the mountain that stood sentinel behind her home. When her husband, the Laird Alexander Stewart, returned home to learn of the horror that had befallen his family in his absence he immediately set out to search for his young wife, but the terrified Margaret was nowhere to be found. For several days search parties scoured the hillsides and woods along the shore of Loch Earn but to no avail. Margaret had in fact given birth alone to a baby son on the shores of a small lochan in the vicinity, known to this day as the Lady's Loch . She was eventually spotted by a party of young girls sent out to the fields to milk the cows. 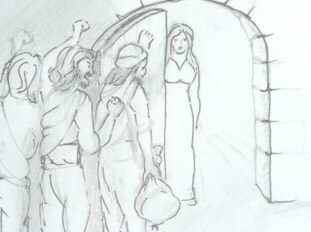 Word was immediately sent to the Laird and she was brought home with her newborn son by her heartily relieved husband. It is well recorded that the Laird's young wife never fully recovered from her ordeal and mentally was never the same again. The baby son she gave birth to by the side of the small lochan turned out to be Major James Stewart, one of the most famous characters in Scottish history, and the one that Sir Walter Scott himself wrote a book about, “The Legend of Montrose”, in which he changed James Stewart's name to Allan McAuley and Ardvorlich castle to Darlinvarach. James Stewart grew up to be uncommonly tall, strong and handsome, though headstrong, young man “ with such power in the grasp of his hand as could force the blood from beneath the nails of the persons who contended with him in this feat of strength”. It was said that as long as he lived Jamie Stewart never spared a MacGregor and that “his mother's sufferings always came before him like blood into his eyes”. The Ardvorlich Stewarts, being direct descendants of the Stewart Kings, were extremely well connected at Court and as long as he lived Major James Stewart saw to it that the MacGregors remained a proscribed Clan for as long as possible and he did everything in his power to ensure that the horrendous fate that befell his Uncle John and his Mother's suffering at the hands of Clan MacGregor were never forgotten. To its final resting place, the family kirk by the lochside at Dundurn, a mile or so from the castle, a band of MacGregors had sworn to be lying in wait to intercept the funeral procession and cut off the Major's head. One can see the stone tablet in the interior of the old Dundurn kirk to this day, dedicated to the memory of Major James Stewart, the baby who first saw the light of day on the shores of that small lochan as his terrified mother gave birth alone in fear for her own life and that of her newborn child. Engraved on the foot of the stone tablet is the name Allan McAuley in recognition of the prominence Scotland 's greatest writer gave to the story of one of Highland Perthshire's and Scotland 's most famous and colourful characters. Balquhidder and Loch Earn are altogether more peaceful places in the 21 st century but the stories of the clansmen who once populated this area still reverberate down the generations and never fail to stir the blood and the hearts of those who love this land. *NB: This article must not be reproduced, republished, posted, broadcast or transmitted in any way for any commercial use or purpose without the prior written permission of author Eileen Townsend. Eileen Townsend is the author of over 40 books including “Of Woman Born”; “In Love And War”; “The Other Woman”; The Love Child”; “Child Of Fire”; “Dreamtime” and “Thine Is The Kingdom” – all bestsellers for Harper Collins. With her husband Professor Colin Townsend she wrote “War Wives”, the highly acclaimed account of British and German women during the Second World War. Eileen was born in Aberdeenshire at the end of the Second World War however her great great grandfather Robert was the last Stewart of the family line to live in the Loch Earn /Balquhidder area. Like so many other young men of his generation he moved to find work. He moved 20 miles to Doune near Stewart relations in the parish of Kilmadock. His youngest brother Rev. Alexander Stewart was the Minister in Killin for over 40 years and a great Gaelic scholar. There is a monument to him in Killin Cemetry.